Juan Martin Del Potro was one of the most popular players on the ATP tour before he succumbed to his first wrist injury in 2010. On his comeback, that popularity has swelled even further as audiences have warmed to the story of his stunning resurgence after years struggling with injury. Del Potro has shown flashes of reaching the level that took him to a Grand Slam title in 2009 but is beginning to convert those flashes into something more prolonged. His capacity to perform at his top level for the entirety of a Grand Slam tournament will be the biggest question mark over Del Potro’s title-winning credentials, but the signs are certainly looking good for the genial giant from Argentina. If the first quarter of 2018 does not entirely belong to Del Potro, it is only because he is sharing it with Roger Federer. Standing alongside one of the greatest tennis players of all time is no bad place to be. Federer stormed to the Australian Open title and also found success in Rotterdam. Del Potro lost disappointingly in straight sets to Tomas Berdych in the Australian Open third round but bounced back to claim the trophy in Acapulco. This was Del Potro’s first ATP 500 title for five years, and it was delivered in convincing style. Del Potro faced a challenging draw in Acapulco; Mischa Zverev, David Ferrer, Dominic Thiem, Alexander Zverev and Kevin Anderson blocked Del Potro’s path to the title, but he swept them aside with impressive confidence. Only dropping a set against Ferrer was an indication of his dominance, but perhaps the more significant statistic is that Del Potro was only taken to one tiebreak (by Thiem) on his road to success. This level of performance was reminiscent of Del Potro’s quality before his first wrist injury in 2010, a recurring injury that blighted much of the subsequent decade. His Acapulco form suggested that Del Potro was ready to make a considerable mark on 2018, and this potential was soon realised in Indian Wells. The first ATP Masters event of the year came in the shape of Indian Wells, and it would be here that Del Potro would claim his first title of this level on the tour. Del Potro had some Indian Wells pedigree, defeated by Rafael Nadal in the final in 2013, but form and circumstance finally conflated for the Argentine to win his first Masters final at the fourth time of asking. His victory is made all the more impressive by the fact that it was Roger Federer who he defeated in the final, the Swiss legend being the other in-form man on the ATP tour. 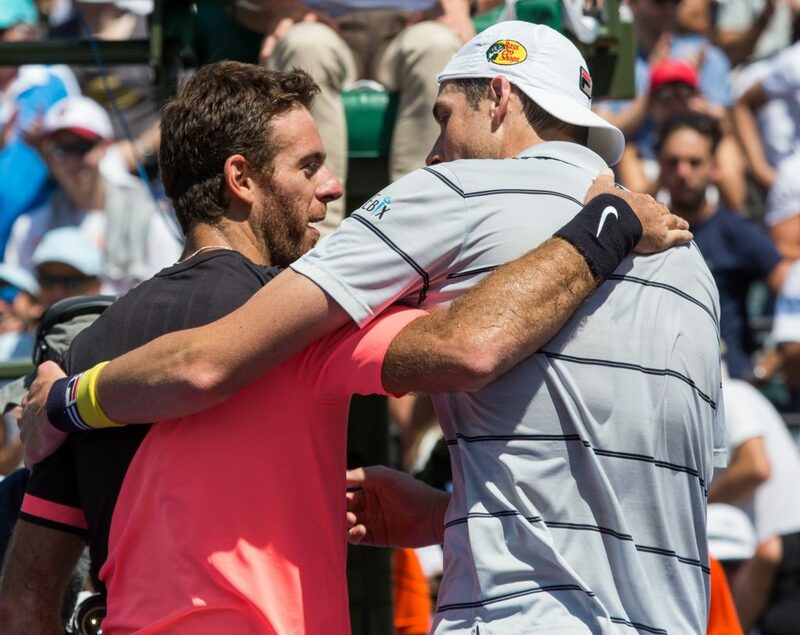 While his Acapulco draw was challenging from start to finish, the Indian Wells draw opened up nicely for Del Potro. The only match where he was not expected to power his way to victory was the final itself. Being able to handle the expectation of being favourite is an integral part to being a player challenging for Grand Slams, and Del Potro looks like he has a handle on the increasing pressure that comes with his increasingly impressive form. With his forehand remaining one of the best shots on the tour, Del Potro’s ability to adapt his backhand to the realities of his wrist injury has improved steadily so that it is no longer a glaring weakness. Although Del Potro conceded the first set to his compatriot Leonardo Mayer and the tricky veteran Philipp Kohlschreiber, he rallied to overcome his opponents. Milos Raonic awaited in the semi-final, but the Canadian has looked a shadow of his former self since his return from injury; Del Potro can certainly sympathise. Federer dropped a single set on his road to the final, with the hard-fought contest that transpired in the final an indictment of both players’ form. Del Potro stormed to the first set 6-4, before saving six set points to earn match point in a second-set tiebreak. Federer survived to claim the set, and Del Potro will have been fearing the worst. Federer broke late in the third set but uncharacteristically lacked the resolve to take one of three match points on his own serve. Del Potro responded with a dominant tiebreak to claim victory after almost three hours of play. The landmark Masters title for Del Potro is encouraging in itself, but the nature of victory suggests that he is ready to contend at the business end of Grand Slams once again. Del Potro’s best performances at three of the Slams have been in 2009 (quarter-final at Australian Open, semi-final at French Open, title at US Open), an indication of his consistently high level before injury struck. That was a golden year for Del Potro, but the signs are looking good for the Argentine finally being able to realise his considerable potential. The current ATP tour holds nothing that should scare Del Potro. Federer’s longevity will give Del Potro hope that he can enjoy a protracted period at the top of the game, and when Federer eventually declines there will be a void at the top of the sport. Rafael Nadal is the King of Clay but less imperious elsewhere, while the younger stars such as Alexander Zverev and Denis Shapovalov are yet to display the mental fortitude required to run deep at a Grand Slam. Del Potro proved he has that fortitude back in 2009. Del Potro is beginning to prove his fitness at a time when Andy Murray, Novak Djokovic and Stan Wawrinka are either absent from the tour or unable to beat a calibre of opponent that they would previously dispatch with consummate ease. Djokovic lost his only matches at Indian Wells and Miami this season to Taro Daniel and Benoit Paire respectively, the former a clay-court grinder and the latter a mercurial but erratic talent. Wawrinka fell to Tallon Griekspoor in Rotterdam, a player who has never breached the top 200 in the world rankings. These players will surely overcome their worries with fatigue and injury to recapture their best form, but there is no telling how soon that will happen. The timing is propitious for Del Potro to add to his solitary Grand Slam; he will be most confident of adding another US Open to his collection, and he will go there as one of the favourites if he is fit. 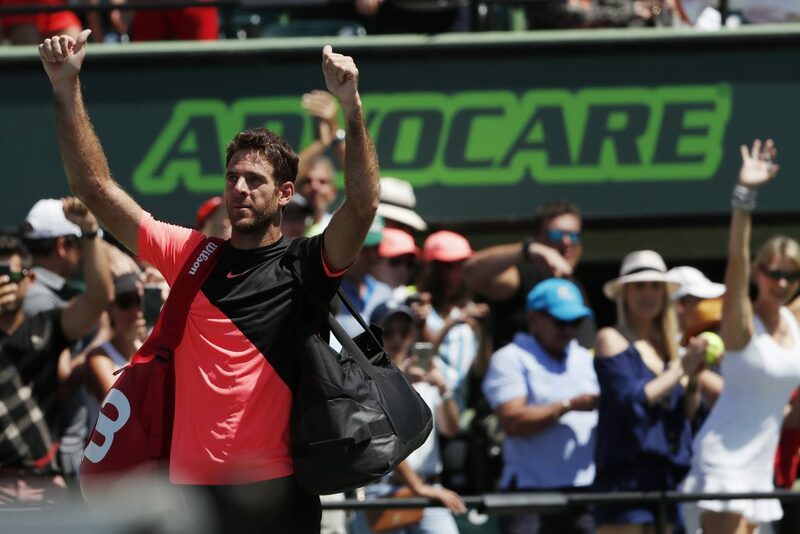 Del Potro continued his Indian Wells form into Miami, where a combination of inevitable tiredness and John Isner’s form saw the Argentine fall in the semi-final. Yet that marked the end of a run of fifteen consecutive victories on the ATP tour, a level of consistency that many feared Del Potro would not be able to show as a result of that wrist injury. Del Potro has banished those doubts and will be looking to make up for lost time.